Musicians locked out by the St. Paul Chamber Orchestra perform an impromptu concert in the hall outside a Minnesota House committee hearing on lockouts. Lockouts have gained popularity among Minnesota employers looking to flex their muscles in contract negotiations with union workers, but state lawmakers yesterday began examining the impact these prolonged work stoppages have had on families, communities and businesses. The House Commerce and Consumer Protection Committee’s hearing on lockouts was likely a first step toward legislative action to protect locked-out workers – and make the tactic less appealing to employers. Committee members surveyed ongoing lockouts at American Crystal Sugar, the Minnesota Orchestra and the St. Paul Chamber Orchestra, as well as the recently settled dispute between the National Hockey League and its players’ union. Testimony, often impassioned, came from labor, management and community stakeholders. Becki Jacobson, a Moorhead, Minn., resident locked out of her job by Crystal Sugar for nearly 18 months, fought back tears as she talked about struggling to make her mortgage payments after her unemployment-insurance benefits expired six months ago. She added that she was recently diagnosed with severe depression. Heidi Durand, a sociology professor and member of the Moorhead City Council, said her community was not equipped to handle the volume of problems Jacobson and Crystal Sugar’s other locked-out workers are facing, from increased foreclosures and bankruptcies to mental-health issues and substance abuse. In the metro area, two pillars of the classical music scene fell silent after the Minnesota Orchestra and the SPCO locked out their musicians last fall. The musicians, members of the American Federation of Musicians Local 30-72, voted overwhelmingly against contracts that included steep salary, benefit and work-rule concessions. Rather than continue negotiating during the 2012-13 concert season, the orchestras went on the offensive, canceling concerts and cutting musicians off from their jobs. At the House committee hearing, orchestra fans and business owners joined locked-out musicians in describing the ripple effects – economic, civic and artistic – of the lockouts. Laurie Greeno, co-chair of the community group Orchestrate Excellence, said downtown Minneapolis merchants already have lost $1.25 million as a result of the lockout. Restaurants have told the group they are losing between $3,000 and $10,000 per concert. Minnesota Orchestra trombonist Doug Wright said orchestra board members have shown a “disregard for the greater musical community,” pointing to music-education programming in schools across the state that has been canceled as a result of the lockout. And SPCO musician Carole Mason Smith warned the committee that each day the lockout continues, the likelihood increases that another world-class musician from one of the Twin Cities’ orchestras will take their talents elsewhere. “Some of us have sold our homes,” she said, pointing to growing frustration among musicians with management’s unwillingness to engage in meaningful dialogue with the union. Although the committee hearing was not related to any specific bill, lawmakers heard some suggestions for how they might get involved. 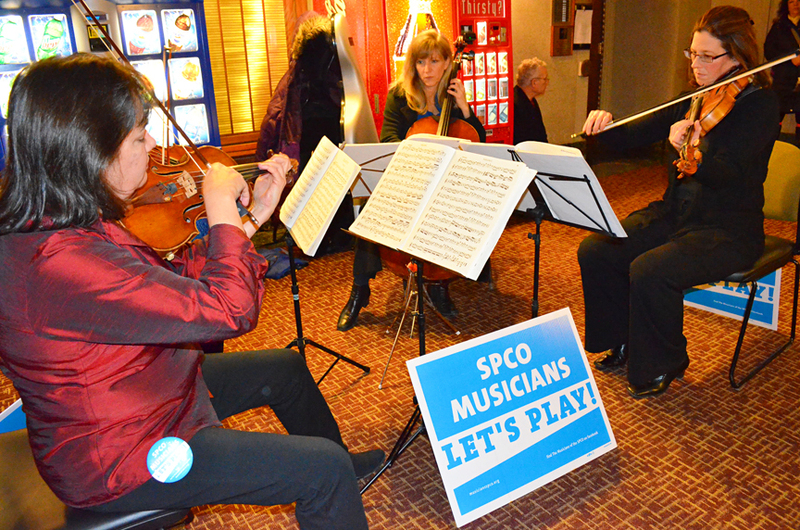 Greeno urged a “thorough analysis” of lockouts’ economic impact on the state, while Mark Thoson of the audience-driven group Save Our SPCO suggested holding the orchestras’ accountable for their nonprofit statuses. “When the state confers nonprofit status to an organization, the state and organization have a duty to ensure the benefit to the public are protected,” Thoson said. Musicians said lawmakers would not be overstepping their bounds by getting involved in the orchestra lockouts, as the state has financially supported the orchestras’ programming and facilities in the past, most notably a $14 million investment in ongoing Orchestra Hall renovations. “We didn’t build Target Field for a minor league baseball team,” Wright said. Unions also will push lawmakers to extend workers’ unemployment benefits for the duration of a lockout. Such an extension would prevent employers like Crystal Sugar from starving workers like Jacobson into accepting their contract demands. Minnesota AFL-CIO Secretary-Treasurer Steve Hunter said the state’s largest labor federation also would support adding a penalty to the unemployment tax paid by employers after a lockout enters its second month. Money collected through the penalty would be split equally between the state’s Unemployment Insurance Trust Fund and the Workforce Development Fund. 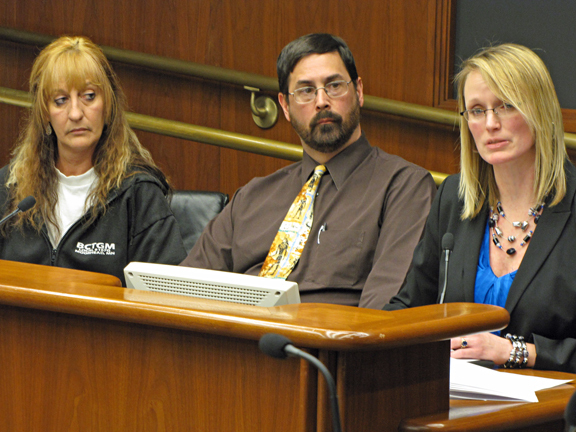 Testifying before the House committee: Becki Jacobson, Moorhead school teacher Jeff Offutt and Moorhead City Council Member Heidi Durand. I am from vancouver,canada and i wanted to say that it is up to the working class here in canada and the usa to fight for the benefit of all working people.The native people here are taking the lead in fighting against the gov. with their organization (Idle No More)The unions here supports this movement. Last year in Quebec the students took to the streets to fight against tuition fee increases.They fought many bloody street battles last summer in Quebec and in the end they brought down the provincial gov.and tuition fees were reduced. In europe similar battles are happening in Spain,Greece and other european countries.Workers everywhere in the world have the same problems and we need to be united against the enemy.